During a game of Toppers vs. Zombies, combining hide-and-seek with Nerf guns, players were nowhere to be found. Campus Recreation’s Fall into Fitness activities reach a mid-week peak today with three free GroupX “theme classes” and several craft events on Ragsdale lawn for Wellness Wednesday. The season-inspired initiative is part of an annual effort by Campus Recreation to promote community health and celebrate the week with fun activities leading up to Halloween. At the Alumni Gym from Oct. 15 to 21, all GroupX classes are free with an option to make monetary donations to the Hurricane Harvey relief fund. As it turns out, de-stressing can involve Nerf guns. 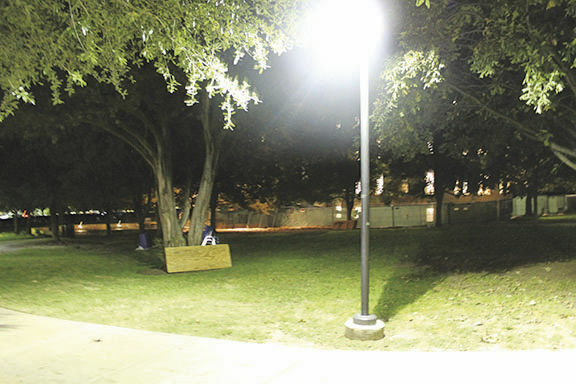 Campus Recreation hosted a game of hide-and-seek tag called Toppers vs. Zombies at 6:30 p.m. with Nerf guns on Monday. Participants divided into two teams and played on Ragsdale Lawn, followed by a get-together campfire and s’mores event at 8 p.m. outdoors on the sand volleyball court by Teresa Hall. Intramural coordinator senior Baxter Coronado volunteered to run Toppers vs. Zombies and the campfire, noting that he first got involved with Campus Recreation as a freshman at St. Edward’s. It was events like these, he said, that allowed him to make friends and stay at the university. Now on the leadership team, Coronado said Fall into Fitness is a time to get students back into a healthy lifestyle and experience Campus Recreation’s wellness opportunities. Tomorrow’s events include sunset yoga in front of Main Building at 6:30 p.m. and a Halloween-themed HIIT (high intensity interval training class) also at 6:30 p.m., with Friday and Saturday events including watching the film “Get Out” while swimming in the Campus Rec pool, lake clean-up and climbing at the greenbelt.